In implementing the Paris Agreement and Nigeria’s Nationally Determined Contributions (NDC), the United Nations Framework Convention on Climate Change (UNFCCC) at the Conference of Parties (COP23), adopted a Gender Action Plan, which would be integrated into Parties Climate Action i.e. the Paris Agreement. For a more holistic climate action, it is important that Nigeria has a unified voice on gender and climate change issues. To domesticate the Gender Action Plan, there is a need to develop a National Gender Action Plan (GAP) that takes into consideration our national circumstances. This document would serve as a guide in mainstreaming gender into climate change plans and programs. 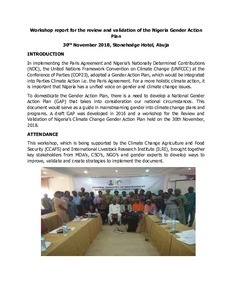 A draft GAP was developed in 2016 and a workshop for the Review and Validation of Nigeria’s Climate Change Gender Action Plan held on the 30th November, 2018. African Working Group on Gender and Climate Change, Women Environmental Programme. 2018. Workshop report for the review and validation of the Nigeria Gender Action Plan. CCAFS Workshop Report. Wageningen, Netherlands: CGIAR Research Program on Climate Change, Agriculture and Food Security (CCAFS).